It’s got sunshine, turquoise seas, long stretches of empty coastline and it doesn’t take a genius to work out that Latin America is home to some of the best beaches in the world. 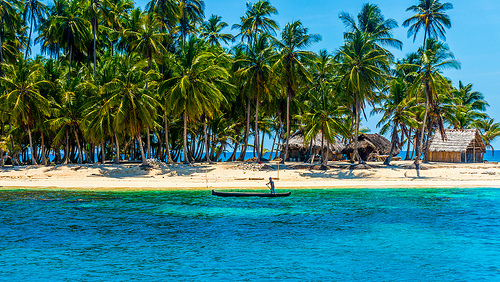 From surfer hot spots to turtles nesting, from the bikinis of Rio de Janeiro to the colourful clothing of the Kuna tribe on the San Blas islands; Latin America has something for everyone. If you’re looking to catch some rays on the soft sands south of the border then check out the top tips below which are all about finding the best beaches in Latin America. If you’re looking for paradise, this is as close as you’ll ever get. Strewn across the Caribbean not far from the shores of Panama, the 378 islands are mostly uninhabited (only 49 have dwellings). The waters are pristine and the white sand beaches, rustic cabins and palm trees make you feel as if you are in paradise. Camping under the stars is a must, as is a visit to the Kuna tribe’s art and crafts market. This island off of the coast of Brazil has a fascinating history. It has been a pirate’s lair, a leper colony and a penitentiary for Brazil’s political prisoners. There are beautiful tropical beaches and virgin Atlantic rainforest, which has led to a ban on cars. Palmas and Pouso beaches on the east of the island are worth a visit. They are accessible via a signposted path from the main town. The winding route takes you through beautiful jungle and via one of the highest points of the island, before breaking out onto the white sands. This is one of Columbia’s most popular national parks. It is set on the jungle-covered coast and stretches for miles. Deep bays with sandy beaches are lined with coconut palms and coral reefs lie close enough to the shore for some good snorkelling. As you would imagine, behind the beaches is thick tropical jungle and you are likely to spot monkeys and iguanas near the beach. This is a prime getaway spot for Argentinians and Uruguayans as it offers a beautiful coastline with a laid-back vibe. It is incredibly popular on the Latin America backpacker trail, with lots of hostels and traveller hangouts in the small town. There are more dreadlocks here than anywhere in South America! If you go in the summer then everywhere is crowded, but if you visit in the winter then the beaches are quiet. There is excellent surfing to be found and beach campfires are a brilliant way to warm up in the evening. This beautiful beach is in the Manuel Antonio National Park, the smallest park in Costa Rica. Despite its size, it is also one of the most popular, which is no surprise as there is so much on offer. The park is a combination of beaches and coral reefs, mangroves and rainforest. There are monkeys and birds in the trees, as well as iguanas and sloths, and at certain times of year you can even spot whales and dolphins. If you can’t sit still then there is a whole range of activities on offer – from horseback riding to white-water rafting, hiking and kayaking. If you just want to enjoy a white sand beach though, the park has the most beautiful white-sand beaches you may ever have seen. Forbes voted it one of the World’s most beautiful parks. This beautiful white-sand beach is backed by jungle and has calm, blue waters. Perhaps the main reason for visiting though is the excellent snorkelling. Roatan, Honduras is known for its diving opportunities and with some of the best snorkelling just off of the beach; this is a great place to park your beach towel.